DCTM has always realized the need for effective interface with industry and business and has undertaken the task of strengthening the relation with them under the CPPD. The Division is the bridge between the industry, the real world and the institute. With the same goal last year, CPPD scheduled 38 corporate drives and 12 seminars for various departments of Engineering and Management. The Campus placement session saw major brands hiring like JBM, WIPRO, Munjal Kiriu, BOSE Music Systems, NetConnect, Innovar Digital, HCL Maintec, HCL TCS, Midas Group, NIRALA Group etc with offers for 109 Students in just a week. Victora Tools & Engineering Pvt. Ltd. for consulting services and training & placements for students of Mechanical & Automobile Engineering. SAP for ERP trainings for students of management & Computer Engineering. INDO Autotech for consulting services and training & placements for students of Mechanical & Automobile Engineering. Starwire India Pvt. Ltd. for training & placements for students of Mechanical & Automobile Engineering. Like previous years the division continued tie-ups with many leading industry brands and their associates to embed special training programmes into the course curriculum as value added programmes. These programmes enable aspirants to be employed in core sector companies through pre-placement offers and paid internship programmes in the final year. Industries Involvement in value addition programmes. Industrial Trainings for the students. 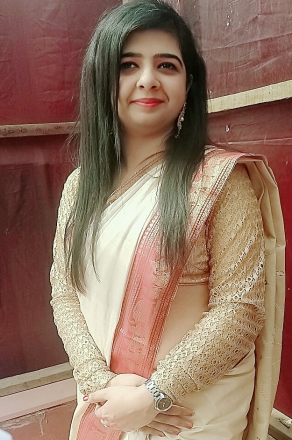 Ms. Anisha Nagpal is an experienced professional with a demonstrated history of working in the domain of web technologies and software development. She is Microsoft Certified Technology Associate for programming and also certified by other professional bodies like AMCAT. She has a teaching experience in the field of Algorithms, Web Development and Intelligent Computing. She is an active researcher and published papers in the areas of Software Engineering and Wireless Sensor Networks. She has a work experience in IT industry as a Software Developer. She is actively involved in Knowledge exchange with HRs of various corporates for gathering information regarding current trends and technologies they are working upon such that same can be imparted to students to match corporate expectations. She has actively updated the training modules and the corporate interaction programs and thrives for industry oriented academics.